DCI will present a free live webcast on Sunday, June 15, featuring Carolina Crown's 2014 debut performance. Drum corps fans around the world will get a complete look at the defending World Champion Carolina Crown's first performance of 2014, during a free webcast presented by the DCI Fan Network Sunday, June 15, at 7:30 p.m. ET. With the Drum Corps International Tour officially kicking off just three days later in Indianapolis, viewers will get an overview of everything that's in store for the summer drum corps season, all while looking in on Carolina Crown's rehearsal which will conclude with a performance of the corps' 2014 competitive production with members in full uniform. "This is a first-ever offering for us," DCI Executive Director Dan Acheson said. "We're excited about the opportunity to use our Fan Network technology to build excitement about the 2014 tour as DCI's World and Open Class corps get ready to hit the road." 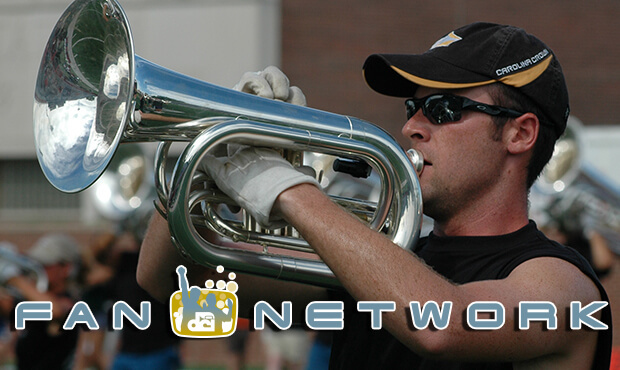 The Fan Network is Drum Corps International's popular media delivery platform that offers subscribers live webcasts of select DCI Tour events, on-demand playback of current and historic corps performances dating all the way back to 1974, audio and video downloads, and more. In 2014, the Fan Network will showcase live webcasts of more than a dozen competitive events, including a number of the most popular tour stops of the year in California, Colorado, Texas, Georgia, Indiana and others. "During the off-season, the Fan Network has gotten an 'under-the-hood' tune-up," Acheson said. He noted that an upgraded delivery system is being implemented to provide subscribers with enhanced stability and that for the first time ever, users will have the ability to stream events live from the Fan Network on their mobile devices. A complete schedule of webcast events and information on season-long subscription plans is now available. Learn more about 2014 Fan Network subscriptions. For those on the East Coast who want to forgo the webcast and see Carolina Crown in person, June 15 will additionally serve as a pre-season celebration of the corps' 25th anniversary. Taking place at Gardner-Webb University in Boiling Springs, N.C., fans, families and supporters are invited to come watch the corps rehearse from 3 p.m. to 9 p.m. ET. As a free event, the organization will offer food, prizes, giveaways and entertainment throughout the evening. Learn more at CarolinaCrown.org.